Last October Microsoft officially revealed its Project xCloud games streaming service. The vision was to enable gamers to "play the games you want, with the people you want, whenever you want, wherever you are, and on any device of your choosing". Microsoft asserts that this isn't an oddball idea – it is exactly the same way people currently enjoy their music. Earlier this week Microsoft provided an update on its Project xCloud progress, and shared the first ever live demo of the service. Microsoft says it has been "heads down and hard at work," preparing to launch public trials of its games streaming service for later in 2019. As work continues it wanted to update everyone on the project's progress and talk a bit more about how the service will work. In the video above you can see and hear an introduction to the games streaming service from Kareem Choudhry, CVP of Gaming Cloud at Microsoft. At around three and a half minutes into the video Choudhry summons a running Project xCloud connected smartphone to be given to presenter Julia Hardy. With the airs of a genuine gamer, Hardy grabs the Xbox One controller, which includes a clamping mechanism to hold the smartphone, and starts racing through the nicely rendered countryside. From the video we see it is hard to determine the quality of the on-screen graphics and the responsiveness of the game experience but the presenter seems impressed. Furthermore, you can see the presenter's twitchy steering seems to be reflected in the on-screen action closely. Imagine that you just began a single-player campaign the day before heading out of town and want to keep playing from where you left off. Maybe you just need a few more minutes to wrap up that weekly challenge before you head into work, but your bus just won’t wait. Or maybe the living-room television is occupied by someone else in the household when you arranged to play co-op with your friends. 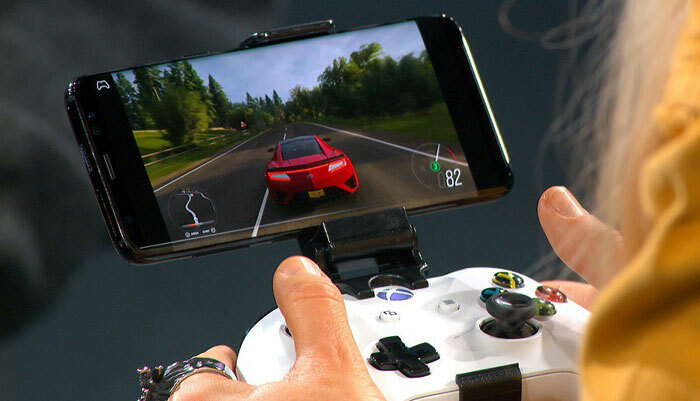 Microsoft's ambition is to offer "true console-quality gaming" on mobile and other connected devices, providing the 2 billion-plus gamers around the world "a new gateway to previously console- and PC-exclusive content". The firm will provide more information and demonstrations of Project xCloud in the coming months, as well as opening up the first community real-world tests later this year. I remember passing the time on the bus by looking out of a window, or reading a book. Those were simpler days. My memory doesn't go that far back. :) I used to sit with a Psion 5MX. Using your phone is the new book. Back under my rock I go, then! Is it wrong that her using the analogue stick like its a digital switch really bothered me. Past that, its basically more cloud gaming, with that if anybody has the money/infrastructure to get this working its Microsoft.